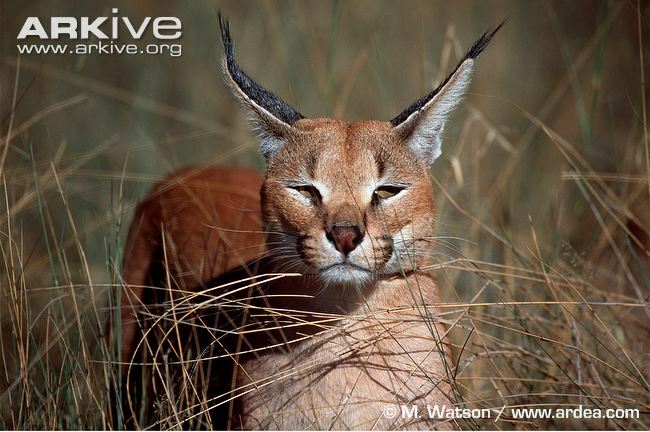 BODY The Caracal is robustly built and is the most powerful of the small cats. Its hindquarters are slightly higher than its shoulders as the hind legs are longer than the front legs. The tail is short relative to its body length. COAT The plain coat is thick but short and soft. The colour varies from yellowish-brown, pale reddish to a rich brick-red, grey or sand-coloured. The underparts are off-white with faint spotting or blotching. 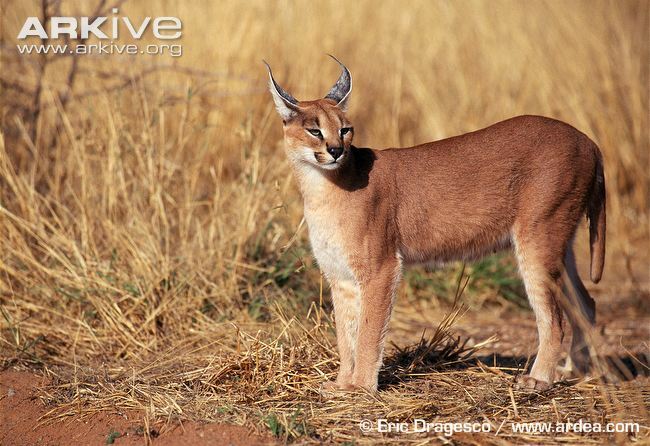 Caracals are one of the few cat species that don't have any spots or stripes. Melanistic (black) Caracals also occur. HEAD The Caracal's face has prominent black and white markings around the eyes and mouth, with white under the chin. The long, pointed ears have tufts of long black hair at the tip. The backs of the ears are black, liberally sprinkled with white hairs. AGE In the wild - up to 12 years. In captivity - up to 19 years.